• Flag pole and ground spike sold separately. 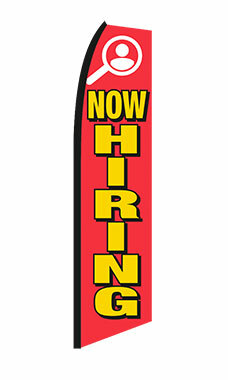 Keep your message on constant display with the Red, Yellow, White "Now Hiring" Wave Flag. These polyester flags remain readable and “fly” even when there is no wind. Use the flags to draw customers into your store. Use with the flagpole and a ground spike to complete your display. Pole and bases sold separately. **Note: These flags are made to withstand up to 25mph winds. They should be brought in for any wind speeds over that.